Not all toothbrushes are created equally. While it might seem like it shouldn't matter, there are some toothbrushes that are much better for your teeth and gums than others. You've probably noticed some toothbrushes that say they have multiple lengths of bristles that are arranged in some unique pattern that makes that particular brush the best. Most of that is simply marketing. 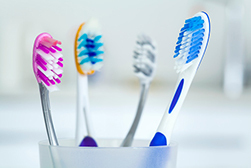 The key to toothbrushes isn't in how the bristles are arranged or even in the lengths of the bristles. Instead, it's in how hard or soft those bristles are. Toothbrushes with hard bristles can irritate your gums and even remove some of the enamel from your teeth. The firmer the bristles are, the more likely it is that they will damage your teeth. There is a little truth to the fact that harder bristles can remove a little more plaque, but in most cases, the damage they do is definitely not worth it. It's much more important to protect the enamel on your teeth and to make sure you're not hurting your gums. Softer bristles certainly get the job done. They remove a good amount of plaque, especially if you're using good brushing techniques and brush several times a day. When combined with flossing and mouthwash, you'll remove a very large amount of plaque and keep your mouth very healthy. Combine that with regular visits to our office for cleanings and checkups, and you'll be fine. But I Like a Firm Toothbrush! Some people have always used a toothbrush with hard bristles. If you're one of them, you might find that using a soft brush just doesn't feel right. If that's the case, please talk to us about it the next time you're in. We can help you find a toothbrush that gets rid of plaque, doesn't hurt your teeth or gums, and feels right for you.